While calibrating some of my Thomas Henry 555 VCO DIY builds and adding some some bigger caps at them and replacing the matched pairs for the Expo converters with better matched pairs, i noticed that when two VCO's tuned to unison you will as it's their nature have some Kind of beating of the waves against each other. If faster this can create some nice sounds and if very slow (almost unison) this will lead if you fed both to a mixer that at one time they cancel out themselves due to slow phaseshifit because they actually run at different rates in the 0,00x % Region and thus will have at one time a different Phase orientation. Signal get's hotter or smaller and at some Point dissapears. This can be easily fixed by syncing one of them to the other, but i wonder how is this handled in normal monosynths with 2 VCO's and w/o sync. What when i want to run them for a certain time at the same frequency and only sometimes would like to pitch up one of them, without having the typcial sync-sound effect? IS there a way to achieve it and how? Also i'm curious About a good way to Play with the perceived loudness of sine and triangle waves, which Sound (at least to my deaf ears) much louder at higher or better said middle frequencies as on the lower ones. Amplitude wise they stay the same but when you have some 200Hz sine and pitch it up to 1 or 2k it sounds like the real Amplitude is heavily increased. Do People care About this phenomen? How do you patch if you want to avoid this? Well to expalin my later Question, i'm experiencing over a longer time the lack some of my Hearing capablties, which could explain this to a certain amount, but i know it's the average capability of the human ear, which is in my case jsut more worse than the average human Hearing capabilities. I know it's a terrible and stupid idea if you are nearly or partially deaf at certain frequency bands to make (or at least try to) something "Musical", but i can't resist to get my Hands off the modular stuff. Firstly, the phase cancellation and addition you are hearing is normal; it's just the simple maths of adding and subtracting. Likewise, the difference in amplitude that we perceive between high and low frequencies is also normal. I don't think it is handled in 'normal' monosynths; the phasing is still there unless you use sync. The nice thing about modular synths is that you have access to each VCO's CV input, so if you want unison, feed them the same CV and if you want one to 'depart', feed it an offset etc. On the loudness question, this is also easier to address on a modular as you can mix CVs to open your VCA, as you suggest. It's similar to what you might do for DX-style FM, where one might want to compensate for brightness on higher and lower notes. Edit: look after your hearing, it's ok for 15Khz to be less audible! Hey Navs, thanks for your Reply, i am Aware that this behaviour is normal and also the perceived Amplitude.... that wasn't in Question at all... i was just wondering how 2VCO monosynth would handle it, because i wasn't Aware that i had experienced this behaviour on them before. Normally you wouldn't just tune VCO's with the same waveform to the same exact frequency, because assuming that they would be 100% identical in their behaviour you would just double the Amplitude and Nothing else whic would make practically soundwise no sense at all… but in reality this almost never happens, because there is Always a Little bit of Variation and that's used to give the Sound a "Living" Feeling, means the imperfection is to acertain extent wanted and part of the process. Within a limited range this makes sense but you wouldn't want to have with an octave the second VCO playing a different note, a few Cents apart is okay and normal, like for example 1200Hz and 1202Hz or so... You wouldn't call if one of them and which is a bit apart from the other, you can only tell that they are, because you hear the beating. Regarding my Hearing capabilities, well i would be glad if i could hear 15khz. I have a tinitus in both ears for more than 10 years now and as i have tested this week couldn't figure out if i'm Hearing something above the 14kHz range and there i had to amplify the Level massively to just recognize something. The sum of two identical in-phase waveforms is 6dB louder than one alone. The sum of two uncorrelated waveforms of equal amplitude is 3 dB louder. 3dB is considered the just noticeable difference in loudness, so nothing special need be done to mix them, other than adjusting levels to avoid overloading the mix buss. For further study, see Fletcher-Munsion curve. Protect your ears, you can't get them back after they are gone. It is going to depend on the synth. VCO synths probably don't do anything, DCO synths can be controlled by the same clock, digital synths will be controlled by the same clock. Maybe the problem is a language barrier, but I don't understand what you are asking when you ask "how would a 2-osc monosynth handle it?". When two oscs are slightly detuned, you hear the beating effect, and the amplitude of the signal increases and decreases with this effect. This is normal and unavoidable and this is what any 2-osc monosynth will do. This effect will be more pronounced or less pronounced depending on things like what type of waveforms are being produced by the oscs, and whether the two oscs are mixed at the same volume or if one is louder than the other, etc. but any time you mix two slightly detuned oscs on ANY synth, you will get this result. You can't sync anything precisely without physically slaving one to the other. This is true even for oscillators. Nature is funny like that. You can't "handle" it without sync on any analogue synth. You'll need a DCO based synth or digital synth if you want that. While it won't get exactly handled, some of the synths have enough drive / saturation going through them that the waves get a bit squashed when the peaks align. This creates a sort of compressing effect, where the amplitude fluctuation gets reduced. A particular (mis)use of this phenomenon was the sine compression bass that can be heard on some Dubstep / DnB / Electro tracks. Two sine waves of slightly varying frequency get ran through a chain of compression / distortion effects, resulting in a sound with roughly static amplitude but varying timbre. Not necessarily - saw waves when they are out of phase with each other are still audible. It's the symmetric waves - triangle / sine / square - that cancel perfectly. A saw at any phase 0-360 is still not an inversion of itself. There's no need to "handle" it. It's not a bug; it's a feature. This is one of the things we love about analog synths: the ability to conveniently set up detuned oscillators with any desired beat frequency between them. Add more VCOs for an even nicer effect. If you want a static sound with no variation, use a single VCO. If you want some life, use more than one. This is the second thread in a short time to ask about "phase cancellation" in a way that seems to make no sense. Like others, I'm tempted to just say something flippant like "Well, when you add 2 and 3 you get 5, how do mathematicians handle this problem?" However, I've thought of a couple of issues that people might be getting at that I don't think have been posted in the threads yet and might be at the root of these kinds of questions. Identical power spectra, but the peaks go up to 3 on one and only slightly past 2 on the other. These are going to sound different, especially after going through anything that clips or distorts peaks. Designing a waveform to minimize crest factor for a given power spectrum is tricky. Just assigning a random phase to each partial seems to work pretty well, although there are also attempts to do it in a more systematic way. I looked at this a bit when I was trying to make nice smooth background pad sounds in Csound, years ago; that's an example of a case where you want a low crest factor because high peaks will draw the listener's attention. 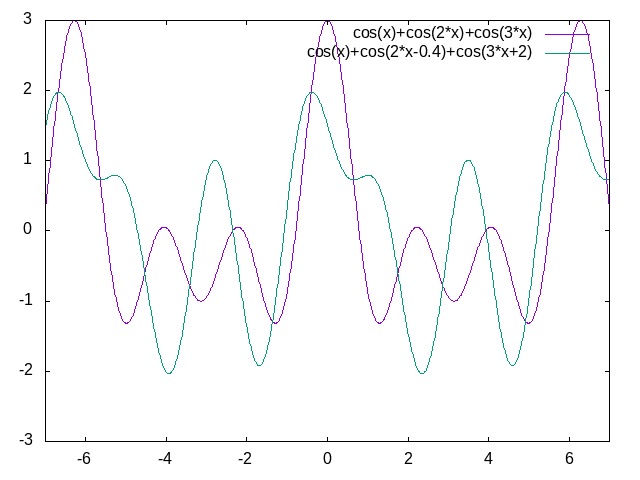 I don't still have my notes from that project at my fingertips, but I remember finding some scientific papers about how to choose the phases for a large bank of sine waves to minimize their tendency to line up and create spikes. In audio engineering it's a pretty common practice to just put a signal through an all-pass filter; that tends to spread out the phases and reduce sharp peaks without doing too much violence to the sound. It's sometimes done with things like piano recordings that have a lot of sharp peaks which otherwise would create problems. Second, there's the question of consonance. We're all tending to interpret the waveform phase cancellation confusion as being all about mixing different shapes of waves at a single fundamental (at most, two slightly-differently-tuned oscillators aimed at the same fundamental), but I wonder if the real question has to do with mixing two different notes, not unison, and wanting them to sound good together. That's just harmony! It's something musicians have been working on for many centuries. The disease of social constructionism has affected music just the same as other fields, and it's hard to fight because the social constructionists are right: what you hear as "consonant" does depend on what your culture has trained you to hear as "consonant." A little bit. They're mostly wrong, because some objectively real effects are very important to consonance and are not socially constructed at all. One of those is slow, but not extremely slow, beating between partials. If you've got two sounds containing prominent partials that differ by something like 5Hz to 30Hz, you're going to hear that beat frequency and it'll play a role in making the combination sound dissonant. The traditional consonant intervals of music theory have the property of avoiding such beats, and that seems to be a big part of why they are consonant. If you play a C and a G together, you're going to end up with each pair of partials either very close (beat frequency too low to be in the annoying range) or far apart (beat frequency too high to be in the annoying range). If you play a C and a C# together, the fundamentals are going to beat against each other at one of the frequencies to be avoided, and the interval is likely to sound dissonant. But it's less true in very low or very high octaves, where the beating between the fundamentals will be out of the danger zone. So if that slow-beat effect is really at the root of what people are calling "phase cancellation," the ways to avoid it might include simply following standard music theory and seeking out consonant intervals; using just intonation so that partials which do coincide will coincide as closely as possible; or diving deep into "xenharmonic" and microtonal stuff to exercise deep control over all aspects of how partials in simultaneous notes relate to each other. In any of those cases it will really be more about what music you play than about how you do your waveform mixing. Between this thread and the earlier one about waveforms being ‘in sync’ I have stumbled across what may be an interesting question. Given a multi-waveform oscillator, is it reasonable to suppose that inverting the sine and mixing it with any of the other waveforms would subtract the fundamental? For the syncing scenario i was thinking of 2 VCO's resting at the same frequency, without having a beating effect and almost no phase cancellation, so that it sounds like a single VCO at all. Then just change the pitch of one of both VCO's for some time to get back to the original, but all wihtout sync which would become audible when you start to change the pitch of the other VCO. Most VCOs are based on integration, so the absolute phase of a free running VCO depends on everything it has been doing since it was powered up. If you had two free running VCOs that just happen to be closely in phase and then change the frequency of one and back again, there is no guarantee what the phase relationship will then be. Even at exactly the same CV. It will depend upon what point it was at in its cycle when the change happened. Or small differences without an exponential converter. Yes, but you will have to lower the sine level slightly to get an exact null. So the phase relationships are such that this ‘just works’? I think I get why the volume would need to be adjusted down somewhat, but the phase issue puzzles me. Doubtlessly due to minimal math competency and lack of deep understanding of how the other waves are derived from the osc core. It depends on how the oscillator is deriving its different waveforms. With all due respect to Mr. Hinton, this is certainly not going to work with every oscillator design. It'll only work if the fundamental of the other waveform is in phase with the sine output, which will be true for many designs but not all. Edit: consider, for instance, an oscillator with two sine wave outputs 90 degrees apart, which isn't a rare configuration. They can't both be suitable for nulling the fundamental of a sawtooth output the same oscillator might have. The sine output is derived from the triangle, so they will certainly be in phase. There is more than one way to get the triangle from the saw, but the most common leave them in phase. If the saw is generated from a triangle a phase shift is possible but I haven't seen this (3340 chips are in phase). Pulse outputs might shift with the pulse width. So GH is mostly correct. The worst case requires a reversible attenuator. Are there any VCOs with both quadrature sine and multiple waveforms? There's the Doepfer A-110-6 - which you might not want to count because it also has phase-shifted versions of its other waveforms, but there it is. Anything that derives a pulse from a saw by means of a comparator is going to leave the fundamental of the pulse at a phase that depends on the pulse width, generally different from the fundamental of the saw. Most analogue VCOs are misnomers, they don't oscillate, they are really function generators. You will hear of triangle or sawtooth cores, which are the two basic methods of making a waveform by integration and all the other waveforms are derived by waveshaping so they will have a fixed phase relationship. If there are quadrature outputs it is most likely a state variable circuit in oscillation so you would be starting with sine and cosine and the only waveshape easily derived from that is a square or pulse in phase with one or the other. Digital VCOs are a different kettle of fish. All waveshapes can be considered as a Fourier series. If you look up some of the websites with graphic demos of how the harmonics sum to make a square, triangle or sawtooth you will see how as you add more harmonics the "corners fill up" and the fundamental is not the same amplitude as the waveform in question. Actually it would have been more accurate to say you may need to adjust the level of the two waveforms you are mixing. Most VCOs have all the waveforms at the same nominal level, often +/-5V, but this is not always so. mskala, regarding how to produce minimum crest factor for a given harmonic energy content, I understand that is best done with FM. It's not obvious to me that using FM to produce a given power spectrum will do it in the way that gives the minimum crest factor. If that is the case, it'd be important. But are we simply talking about different things? I said "power spectrum" and you said "harmonic energy content," which might not be the same. "The number of side frequencies that occur is related to the modulation index in such a way that as I increases from zero, energy is "stolen" from the carrier and distributed among an increasing number of side frequencies." Intuitively, it makes sense. Take a sin oscillator and FM it. The power spectrum (or harmonic energy content, the term I used to mean the same thing) certainly includes more frequencies, but the amplitude remains constant. When I say "power spectrum" I mean the specific amount of power at each frequency - a whole list of numbers one for each partial - not just the total amount of power. I don't think in general it's possible for FM to produce an arbitrary power spectrum, unless we stretch the definition of what counts as "FM" until it means nothing; and that first quote about power moving from the carrier to the sidebands only means that the RMS value doesn't change with modulation - which is hardly news. But it does look like for the spectra FM is capable of producing FM does it with optimal crest factor, and that's pretty useful! The figure labelled "FM waveform (index: 3.0) vs sum of cosines with the same (relative) component amplitudes" in that second link is a very nice illustration of what I mean. ...Anything that derives a pulse from a saw by means of a comparator is going to leave the fundamental of the pulse at a phase that depends on the pulse width, generally different from the fundamental of the saw. Is it so? Seems to me that phase relationship shown in the picture below (as if a comparator was used) gives the fullest sound. I don't know what "fullest sound" means, but those two waveforms do not have their fundamentals in phase with each other. A sine wave that would be in the right phase to null out the fundamental of one, would not be able to completely null out the fundamental of the other.